Do you have leaves, garden debris, or grass clippings that you need handled? 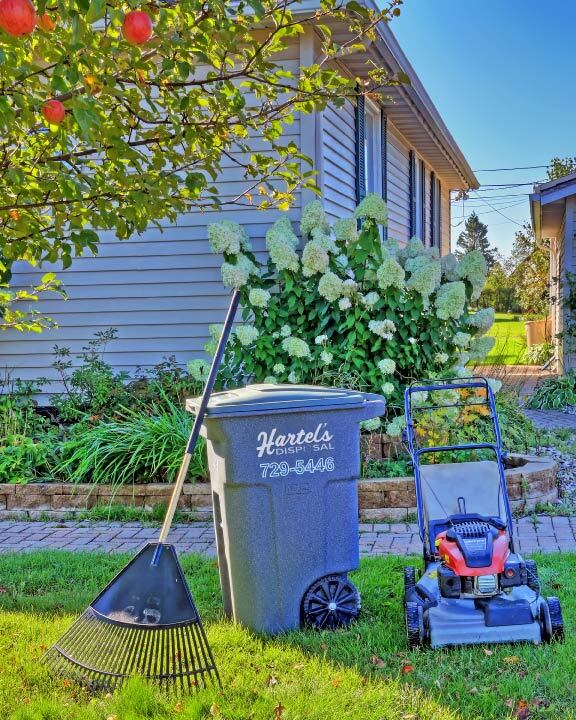 Hartel’s Disposal is pleased to offer on-call yard waste pick-up in most areas of Duluth and Proctor. All you have to do is call when you need a yard waste pick-up and our crew will do the rest. $83/season for 96 gallon cart size. MAXIMUM 12 paper compostable bags outside cart. First 6 paper compostable bags outside cart – No Charge. Over 6 bags, up to 12 total – outside cart, $2 per bag. All paper compostable bags outside cart – $2.00 per bag. Only paper compostable bags can be accepted. Any bagged yard waste must be outside your cart. Click here for types of bags that are acceptable. *Service not offered in all areas. To sign up for Yard Waste Service, please call office (218) 729-5446. If you have already signed up for Yard Waste Service, and would like to schedule a pick up for your cart, please visit our Schedule Yard Waste Pick Up page. Pick up should be scheduled before noon of the day preceding your collection day.